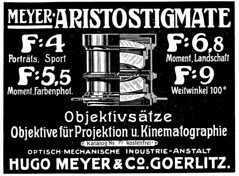 Meyer was a German optical company, founded by Hugo Meyer (born 21.05.1863, died 01.03.1905) in Görlitz. 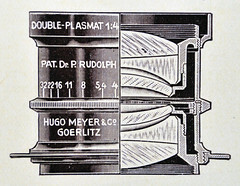 In 1918 Dr. Paul Rudolph, the inventor of Zeiss' Tessar and Protar, developed Meyer's Double Plasmat which was derived from Meyer's symmetrical Euryplan lens. In the 1920s he developed fast variants, the Kino-Plasmat f/2 and the World's fastest lens of its time, the Kino-Plasmat f/1.5 . 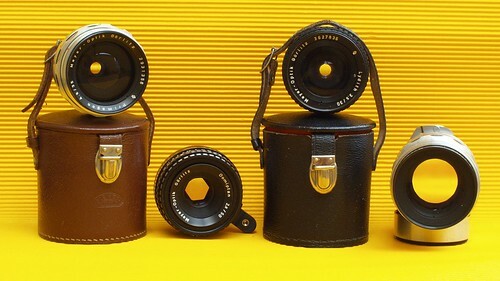 After WWII Meyer was the second East German lens supplier after Carl Zeiss Jena. It became a part of VEB Pentacon and after some point, all the Meyer lenses were renamed Pentacon. 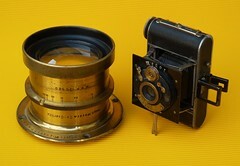 In mid 1960s Meyer introduced lenses with interchangeable adapters for different camera types. The first such a lens was Orestegor 4/200, which could be mounted on Exakta Varex, Exa II, Pentacon, Praktina and Praktica 35 mm cameras with applicable adapters. Orestegor 5.6/500 could be mounted on Exakta Varex, Exa II, Pentacon, Praktina, Praktica as well as Praktisix medium format SLR. After German reunification the last original company's lenses were made until it's bankruptcy n 1991. In 2014 the brand management company Globell revived the brand on the Photokina. Later the new technology company net SE announced the production of the new Meyer lenses in cooperation with original Meyer optics engineers from Görlitz. In 2018 OPC Optics, a maker of special lens elements based in Bad Kreuznach, bought the brand from the bankrupt net SE. For lens serial numbers see THIS page. 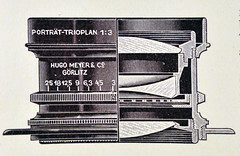 The production of the lenses marked Domiplan, Oreston, Orestegon, Orestor, Orestegor, Lydith was continued when Meyer was incorporated into Pentacon. The lenses except the Domiplan lost their trademark names when they became Pentacon lenses. about net SE's newest "Germanifications"
This page was last edited on 19 December 2018, at 19:38.